Are you a perpetual four fault rider? There’s nothing more frustrating than having an otherwise great round but taking poles, especially ones that could be avoided with a few quick fixes. Of course, not every round will always be faultless and some horses are naturally more careful than others, but these five tips could just be the difference between a clear and a pole! Try them out and see whether the clear rounds start coming! Sometimes, you see riders dropping their shoulders or hunching over the jump. Another common fault is for riders to fall forwards onto the horses shoulder as they take off and in mid-air. Coupled with looking down, this can put the horse’s weight onto the forehand, making it that much harder for them to snap up their legs and come off the ground quickly. Just by keeping your shoulders up and back on the approach and keeping your eyes up as you take off and land, you can help your horse stay in better balance. This has the double benefit of helping you look for your next fence earlier on and also meaning you’re less likely to come off if your horse stops! Let’s face it; some horses have better jumping technique than others. Some horses don’t really care that the coloured poles fall, while others will run off bucking if their toe so much as clips a pole. And if your horse is the type who tends towards the ‘less effort’ side of the scale or doesn’t have the best natural jumping technique, it’s your job to try and develop their jumping as much as possible – the show is not the place to do this, unsurprisingly! Grids or gymnastics are the go-to method for improving a horse’s jumping. Not only can it help them learn to jump bigger fences without destroying confidence, they’re also great for developing athleticism, adjustability and improving the shape of the jump. V-poles put on jumps can also help the horse to bascule better over the fences, and are easy to work into the grids. Play with different distances, different types of fences and different lengths to keep your horse thinking. Don’t just meander around checking out which order to jump the fences in. It’s important to walk it properly, take note of any tight turns or areas that your horse might find difficult (e.g. is there a spooky fence going away from the gate?). It’s also important to walk the lines you intend to ride, which will depend slightly on your horse. If a distance walks in between a 5 and a 6 stride, it’s important to know what ride you want to go for. If there’s a related distance on the curve to your horse’s stiff side, you may want to ride an outside line to give yourself more time to rebalance. Consider all of these things while you walk the course and have a plan in place for when you go in to ride it. As you’re riding your course it’s important to plan your turns and lines. Make sure that you prepare for your landing and the next fence by letting your horse know where you’re going and helping him to land on the correct leg. If you’re riding a related distance curving to the left, for instance, but you land on the right leg after the first fence, your horse is likely to arrive at the second fence unbalanced and possibly on an awkward distance. Learning to land on whichever leg you want is a key skill to riding clear rounds, especially as you go up the grades and your horse gets older and more proficient. 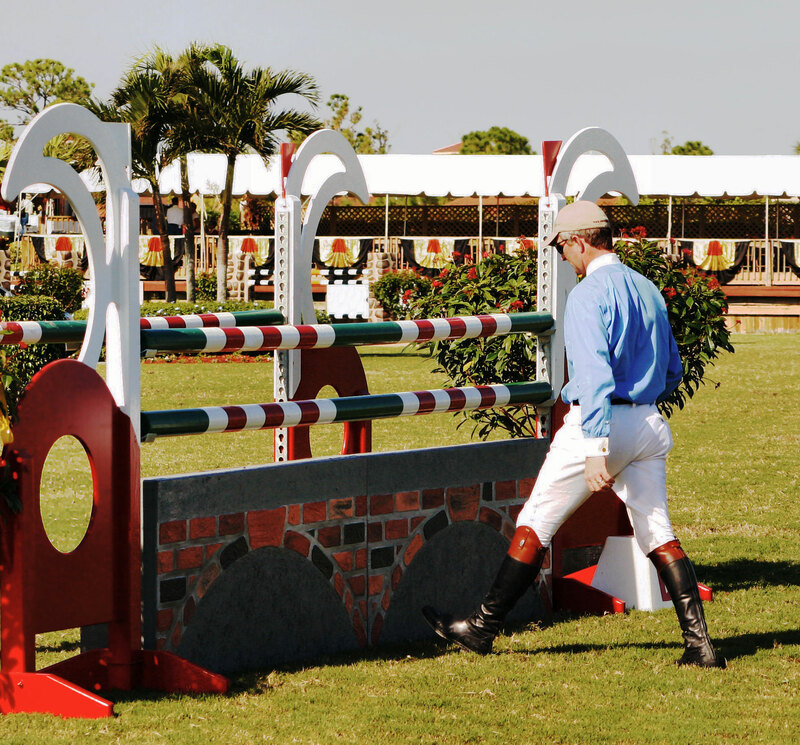 Practice at home over a single fence, landing on the leg that you choose each time. A show can be lost or won in the warm up arena. It’s important that you use it for the intended purpose; to warm the horse and prepare him for his performance in the ring. There’s no use putting in a spectacular performance in the warm up arena only to have your horse’s petrol run out in the ring. On the other hand, you don’t want to do too little so that your horse is underprepared for the ring either. This will, of course, depend on the individual horse and getting it right will take some trial and error. You may even find that the warm up differs from venue to venue, depending on the size of the warm up arena, how busy it is, what the actual show atmosphere is like, and so on. Generally, the aim of the warm up is to make sure that your horse is listening to your aids – is he collecting and lengthening when you ask? Turning neatly? Staying in a rhythm? Jump enough to get your horse responsive and ready to jump at the right height in the ring, but not so much that he’s tired. Ideally, you want to be finished with one or two horses left so that you can walk over to the ring, watch a horse, and give yourself a minute to focus before going in and jumping your clear!